This building is situated at a busy crossroads, but its massive, square shape radiates tranquillity. 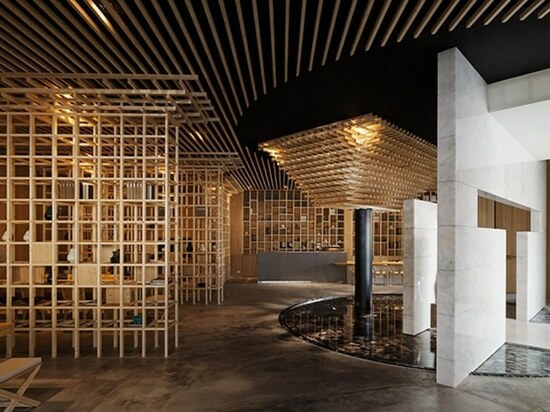 The entrance appears calm and inviting and is dominated by numerous lattice-like structures made of wood. A large window makes it possible to look inwards. The timbered interior creates an alluring contrast to the dark facade of the house. Shrubs have been planted in front of the window to shield the house from street noise and create a peaceful atmosphere. With its bulky form, this building looks like an oasis of calm. The fascinating use of wood for the interior is very pleasing.